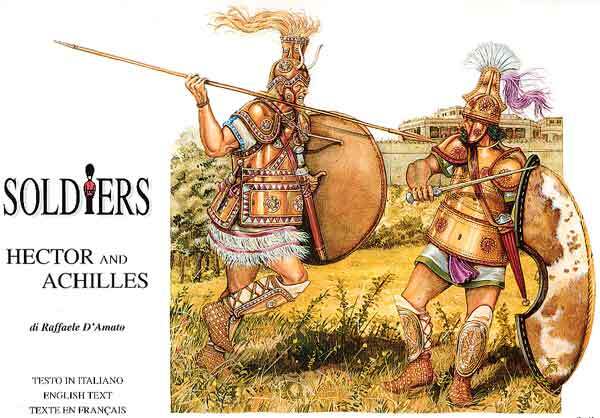 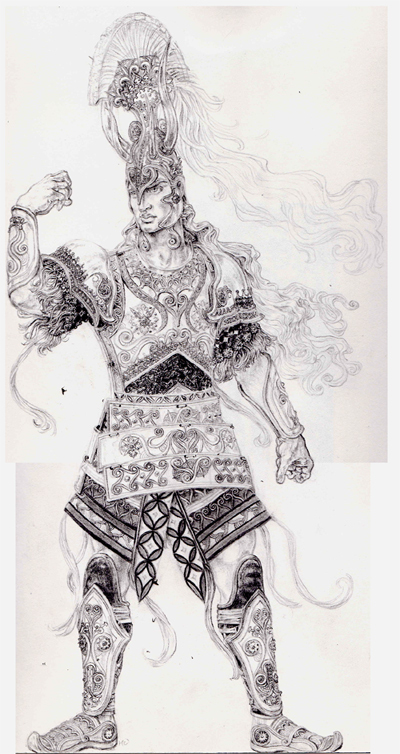 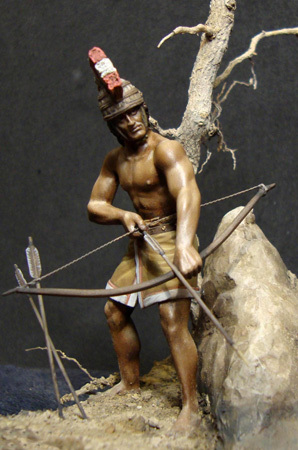 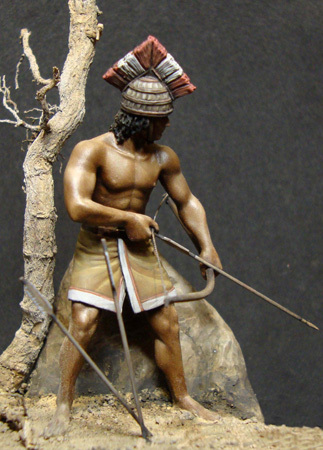 The following drawings and figurines of Achaean warriors and Bronze Age people are mainly based on archaeological evidences (pottery, fresco, reliefs, sculptures, weaponry etc.). 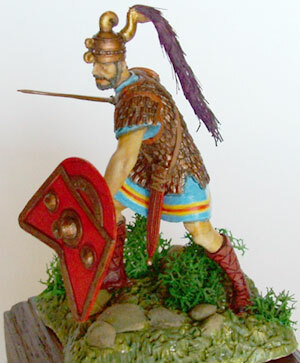 Even the hypotetical representation are reasonably reconstructed considering various elements and fonts coming from Greek Late Helladic period, Central Europe, Anatolian and Easter Mediterranean Bronze Age period from about 2000 to 1000 BC as well as Homer's descriptions in the Iliad and the Odyssey. 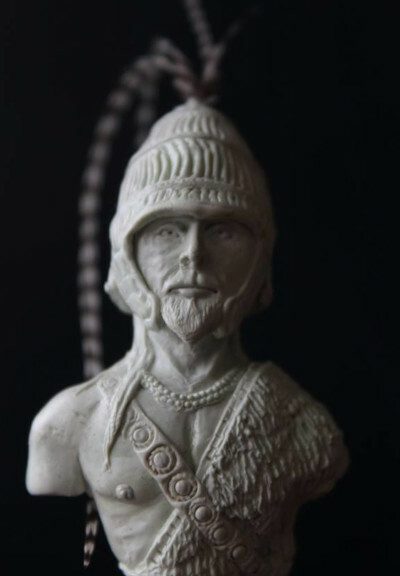 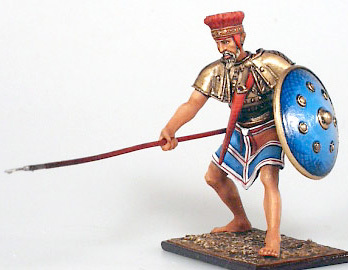 Ajax Telamones with Dendra style armour (Trojan war 1250-1210 BC) selfconstructed plastic/putty figurine (artist Andrea Salimbeti). 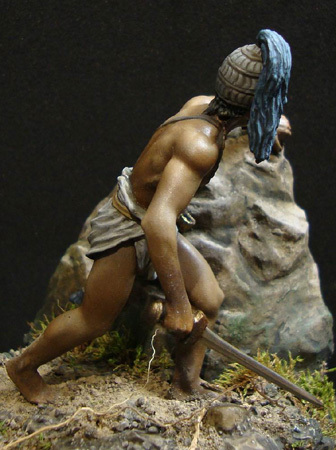 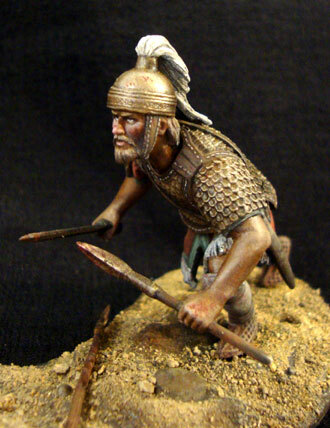 Philoktetes (Thessaly 1250-1210 BC) metal figurine from Russian Soldier Art (artist Andrea Salimbeti) Odysseus (Ithaca 1250-1210 BC) modified metal figurine from Ares Mythologic (artist Andrea Salimbeti). 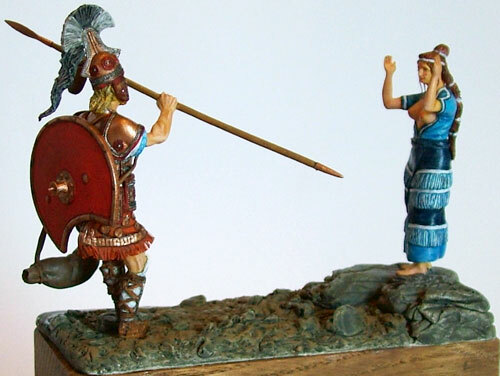 Achaean warrior (Thebes 1300 BC) modified metal figurine (artist Andrea Salimbeti) Helen (Lakedaemon 1250-1210 BC) metal figurine from Russian Soldier Art (artist Andrea Salimbeti). 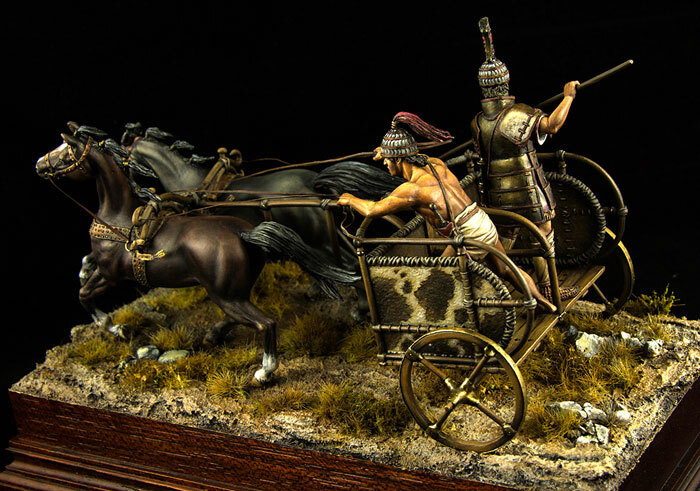 Achilles and Penthesilea (Trojan war 1250-1210 BC) modified metal and plastic figurines (artist Andrea Salimbeti). 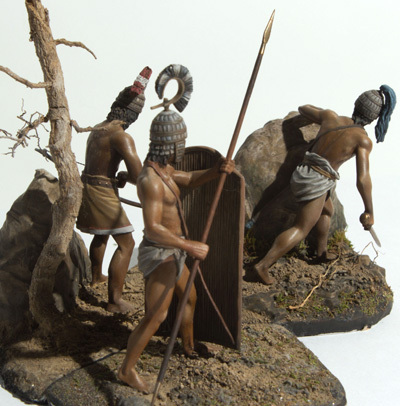 Eteocles and Polyneikes (Seven against Thebes 1300 BC) modified metal figurines (artist Andrea Salimbeti). 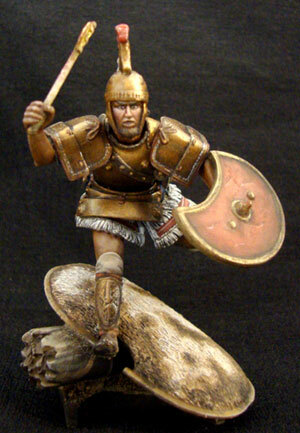 Periphetes (Trojan war 1250-1210 BC) metal figurine from Russian Soldier Art (artist Andrea Salimbeti) Aeneas (Trojan war 1250-1210 BC) metal figurine from Kingdom Model (artist Andrea Salimbeti). 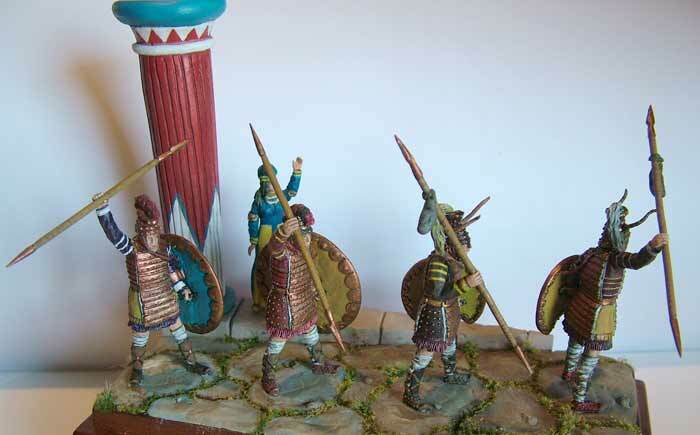 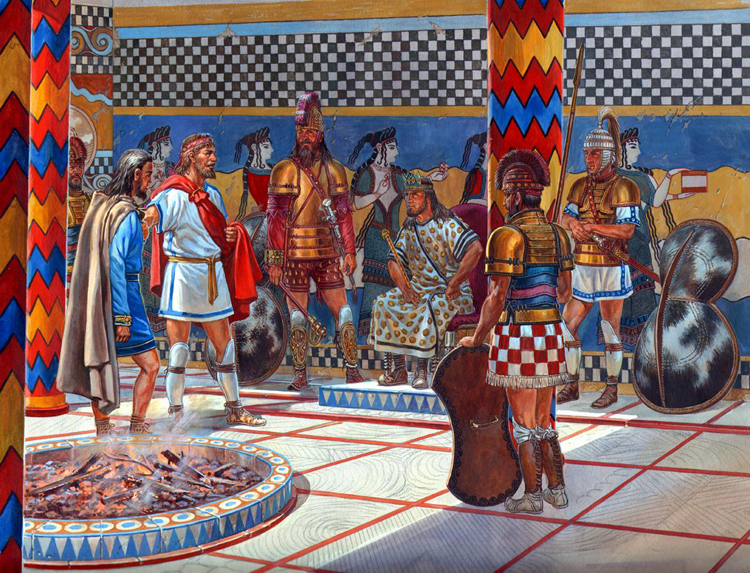 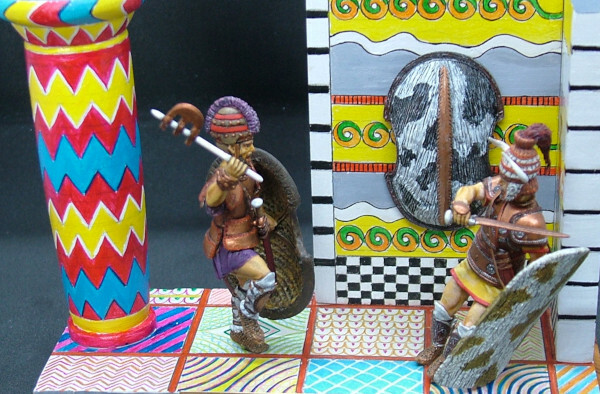 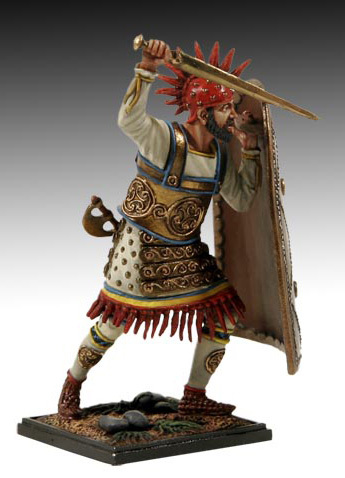 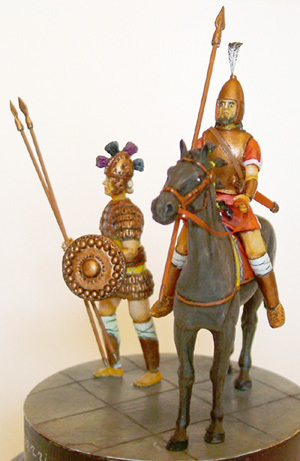 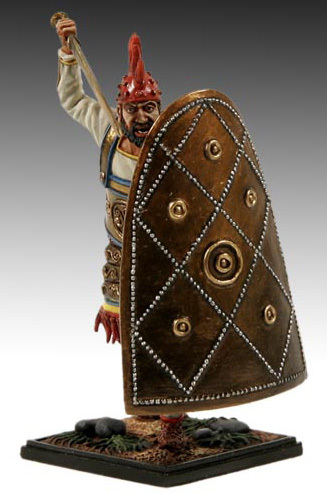 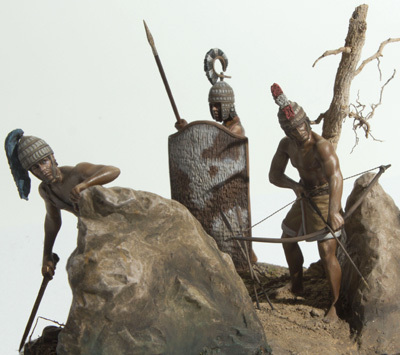 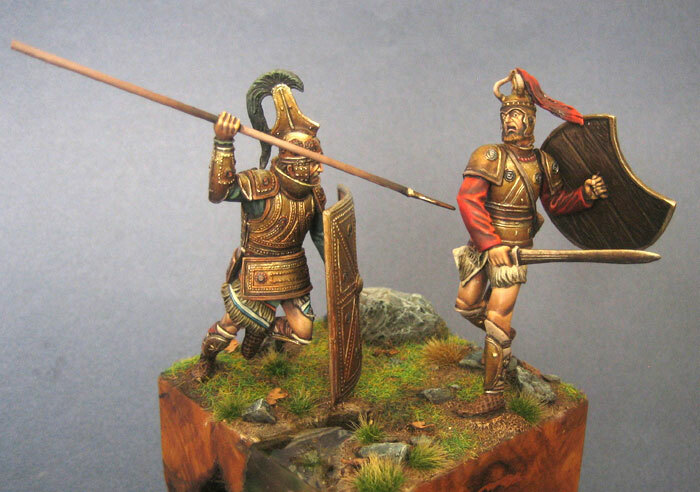 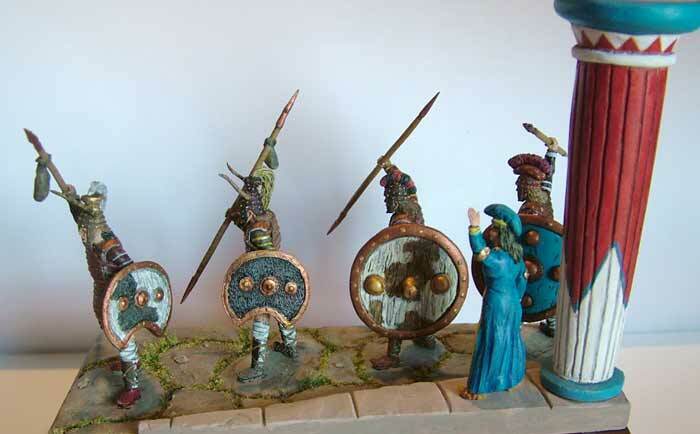 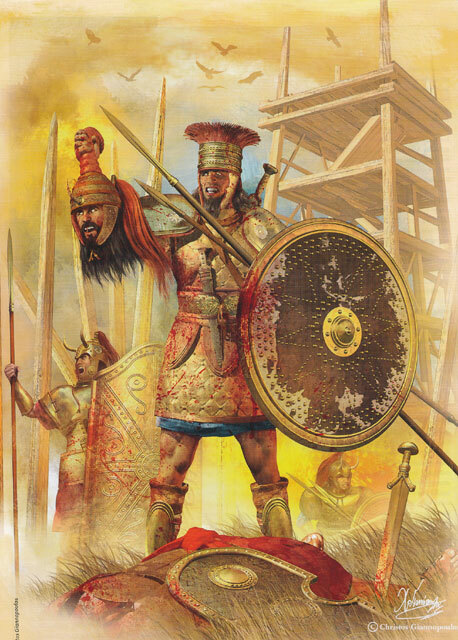 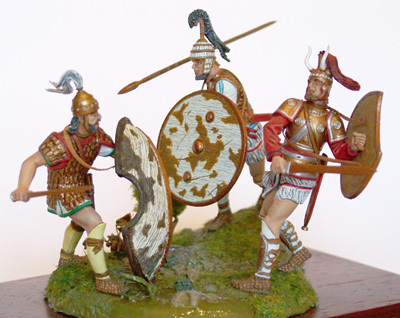 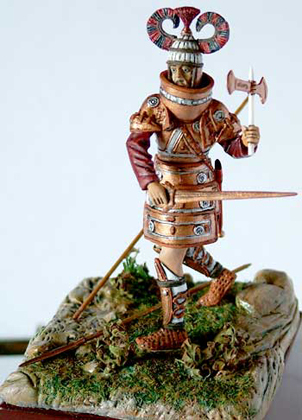 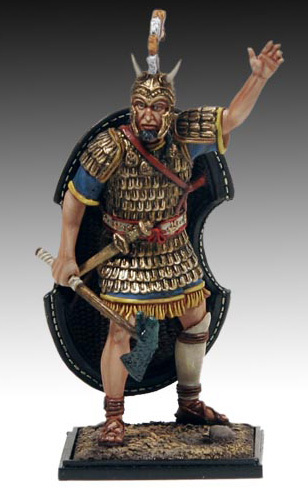 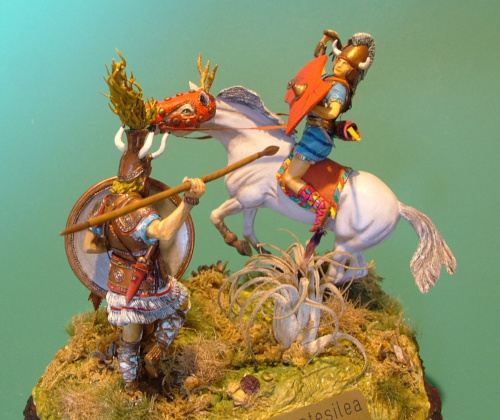 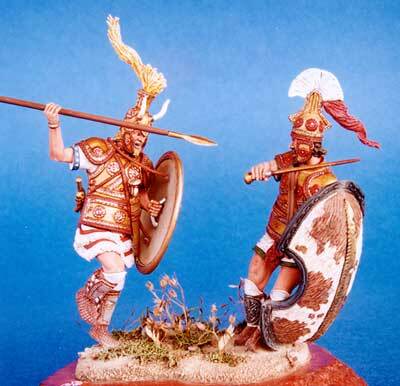 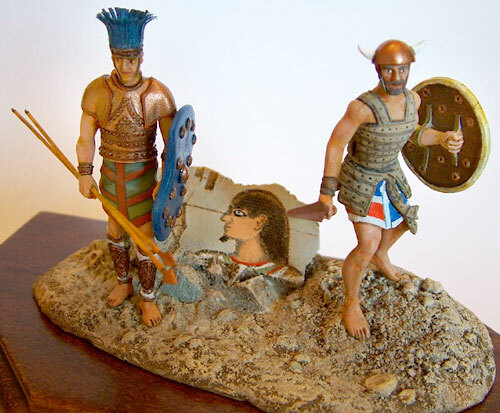 Minoan and Achaean warriors (Knossos about 1430 BC) metal figurines from Russian Soldier Art (artist Andrea Salimbeti). 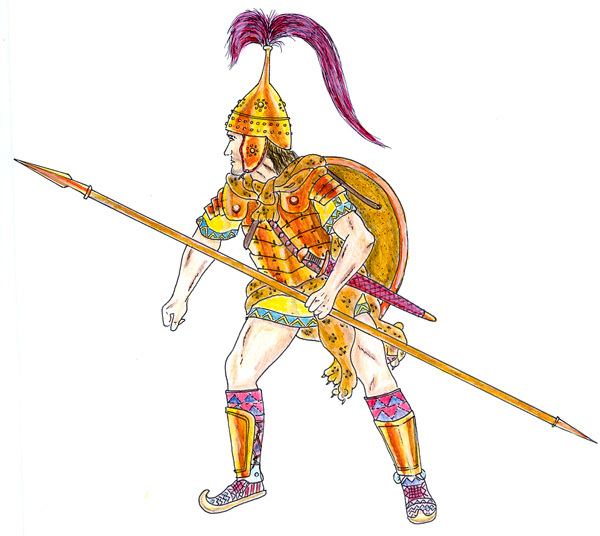 Achaean warrior (Argolid about 1300 BC). 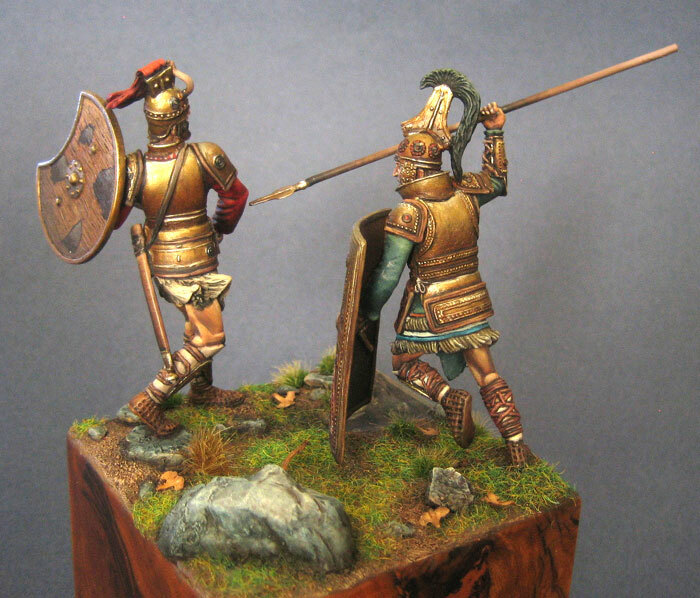 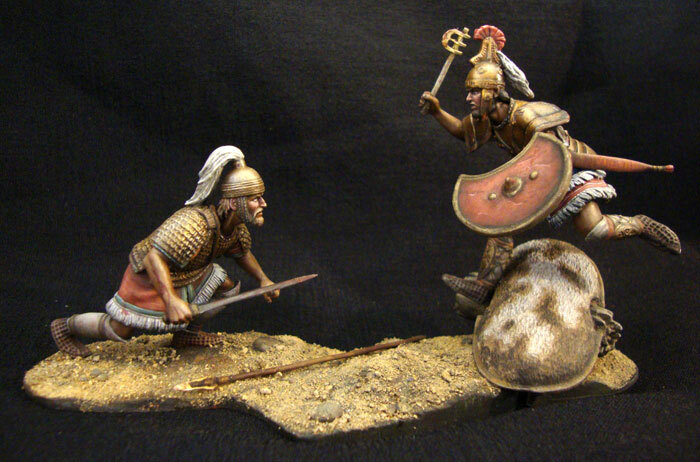 Patroclus and Hector (Trojan war about 1250-1210 BC) metal figurine ALIVE HISTORY MINIATURE. 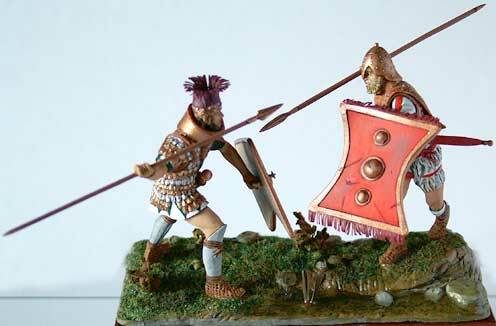 Patroclus (Trojan war about 1250-1210 BC) metal figurine ALIVE HISTORY MINIATURE. 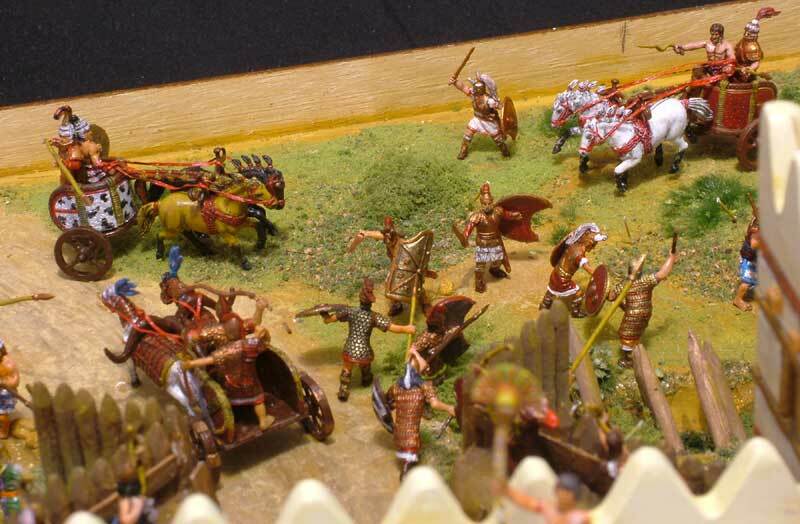 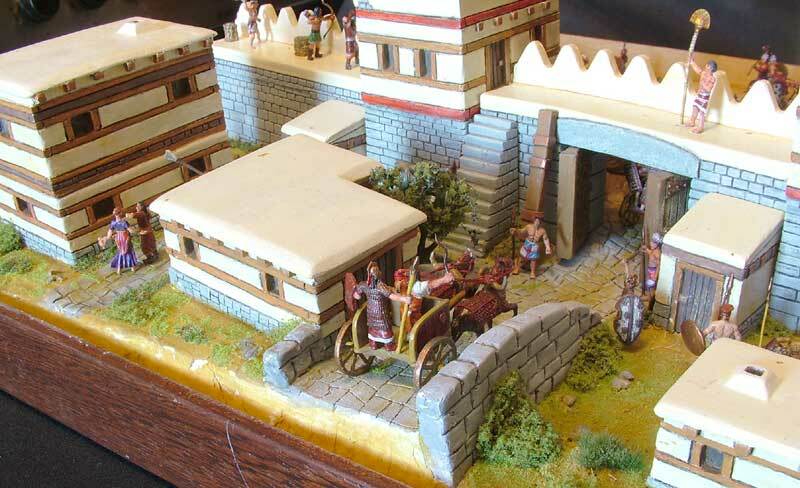 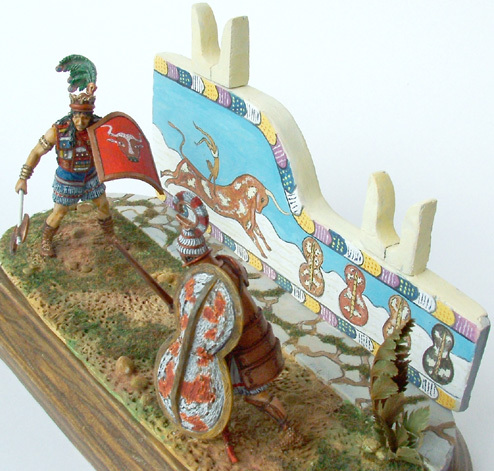 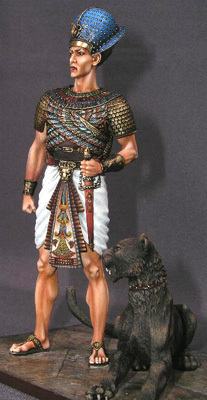 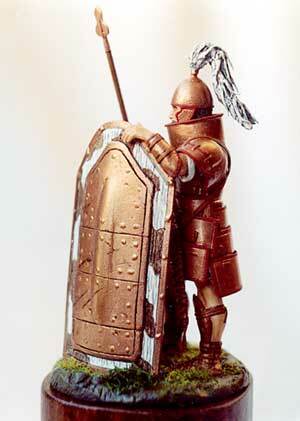 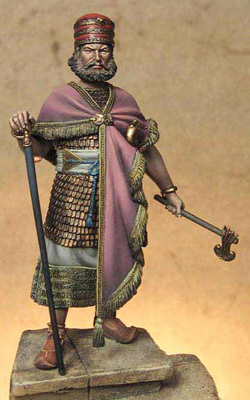 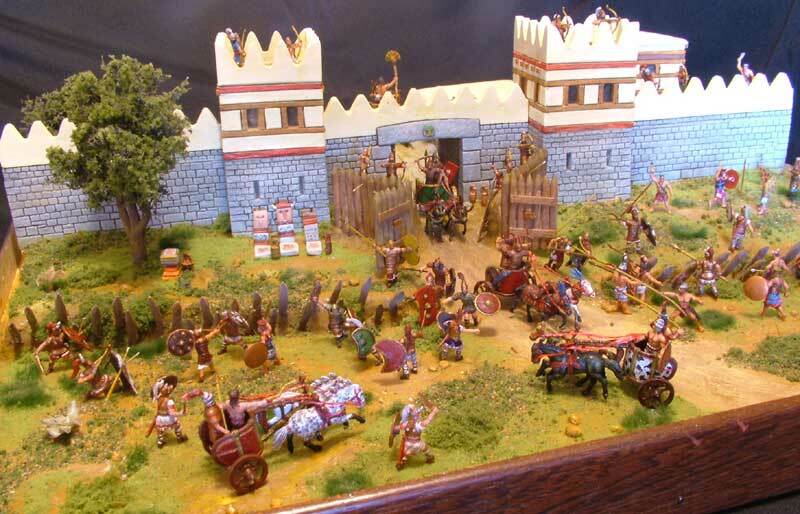 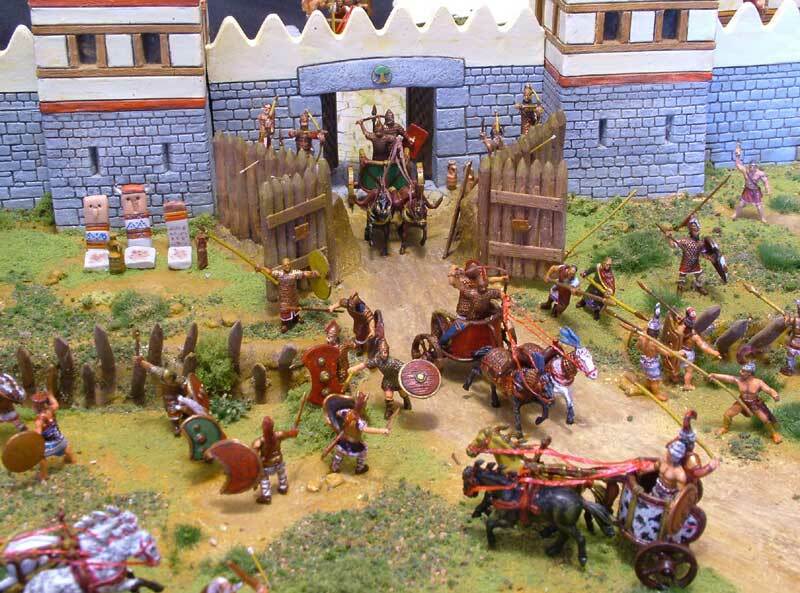 Hector (Trojan war about 1250-1210 BC) ALIVE HISTORY MINIATURE. 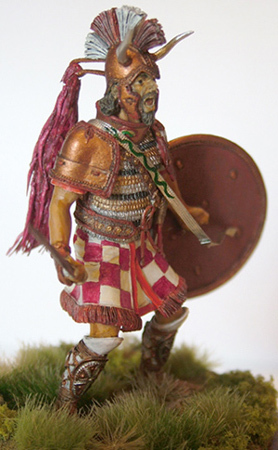 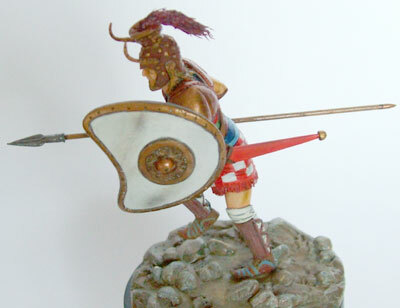 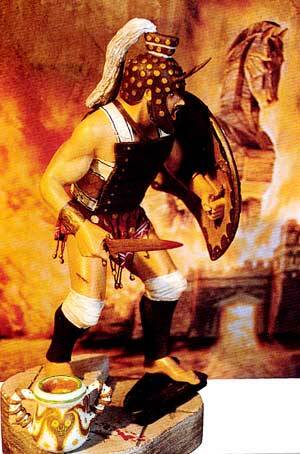 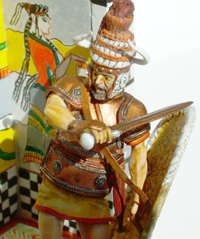 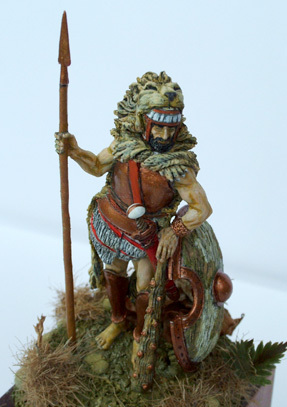 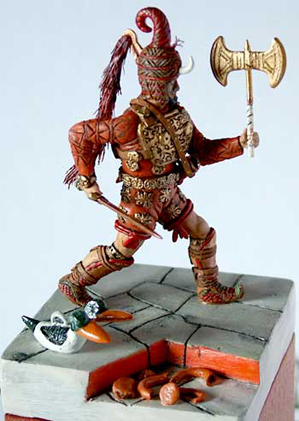 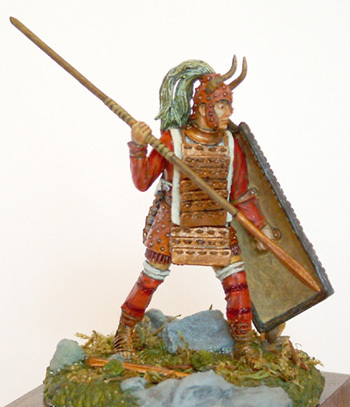 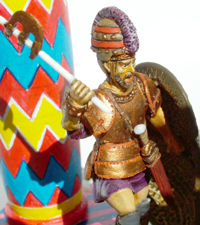 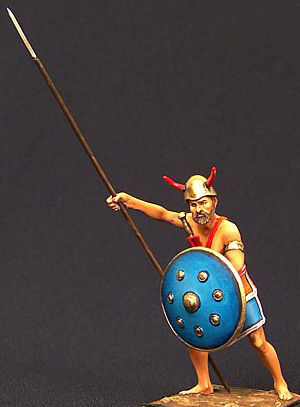 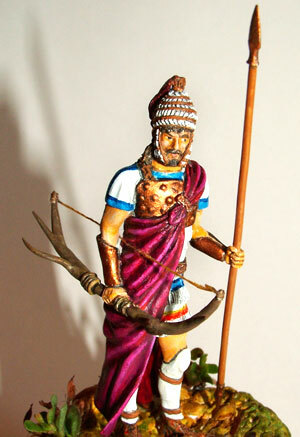 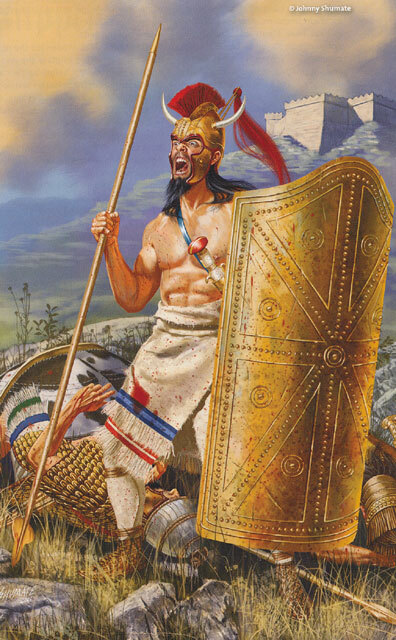 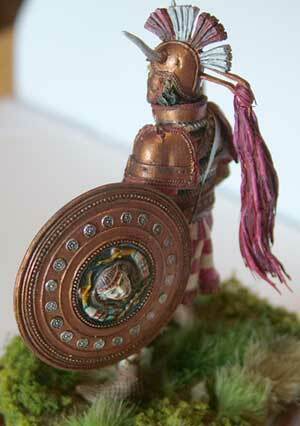 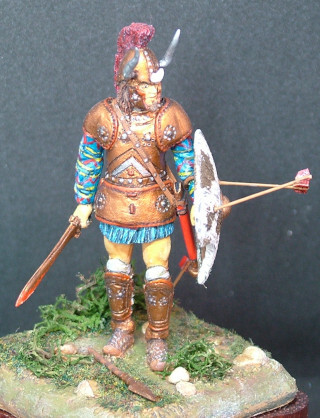 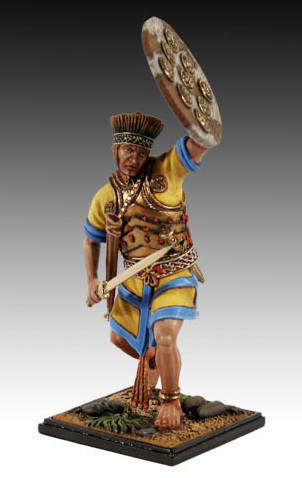 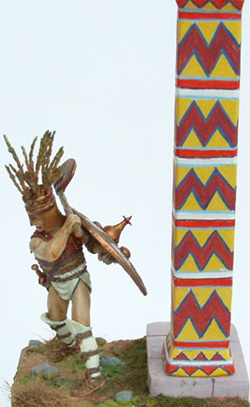 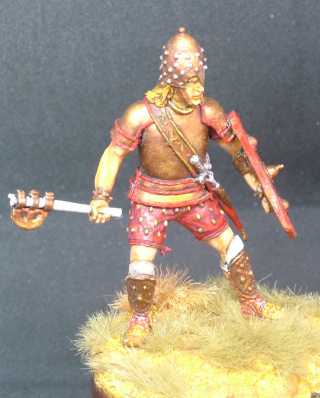 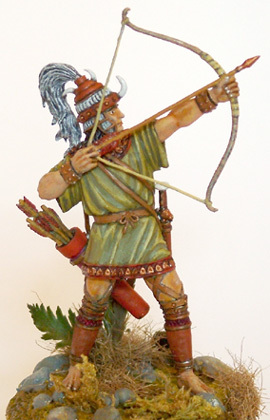 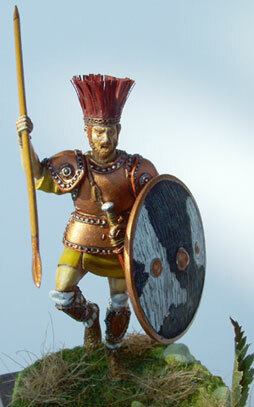 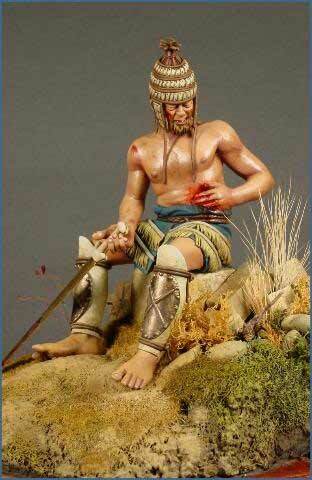 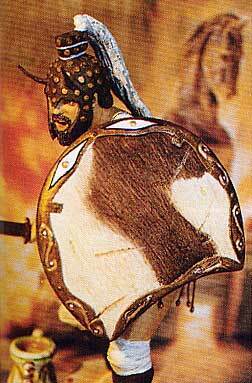 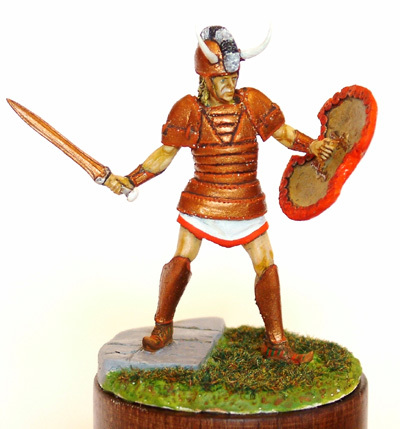 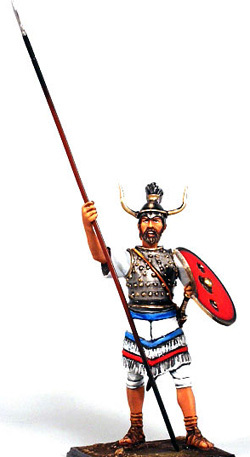 Minoan warrior (about 1450 BC) ALIVE HISTORY MINIATURE. 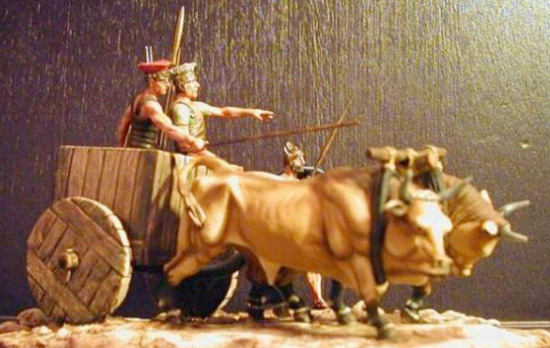 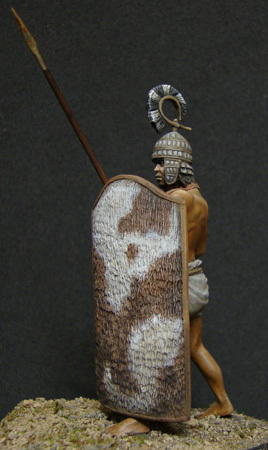 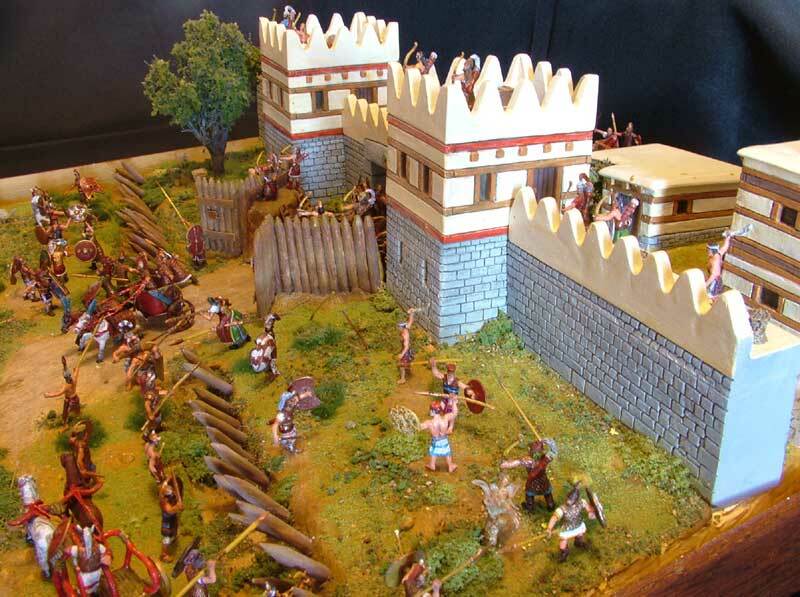 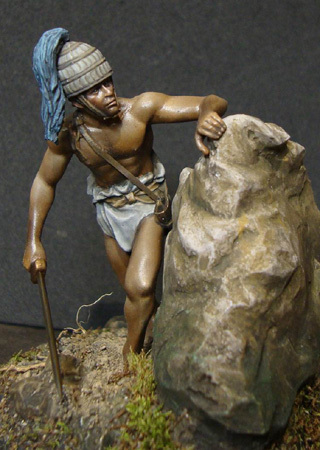 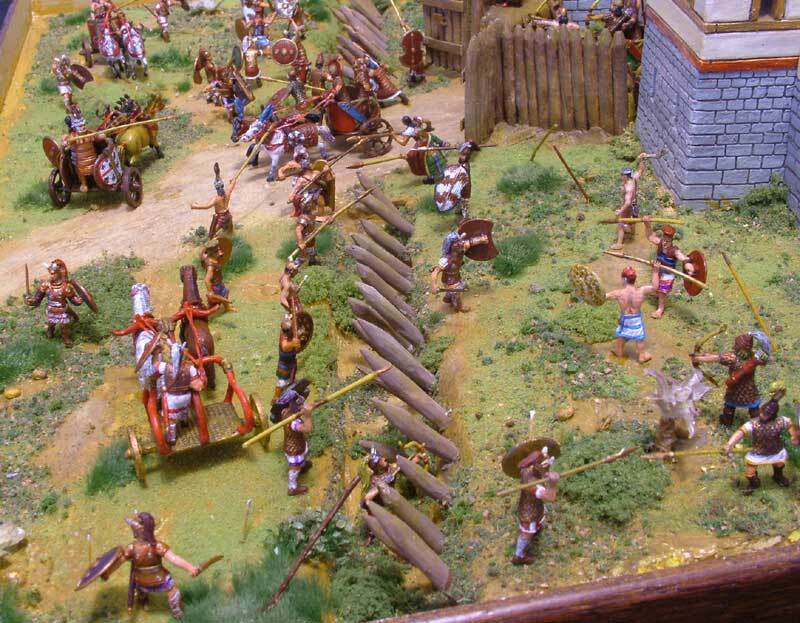 Wilusa (about 1250-1210 BC) Resin fortification from BAUEDA, platic figurine from CAESAR MINIATURES. 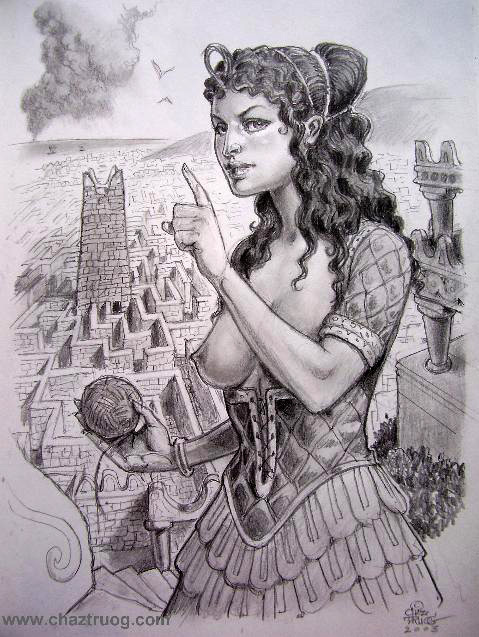 Artist Andrea Salimbeti. 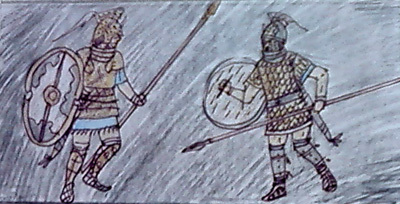 Battle between achaean warriors (about 1200 BC) drawing by Jeison de Souza from Brasil . 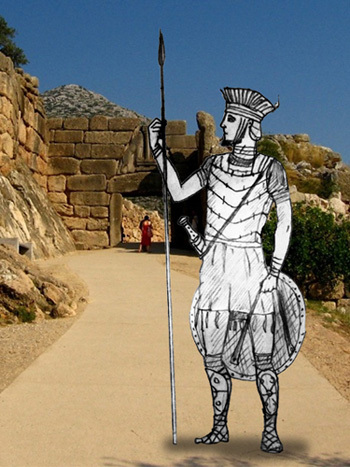 Sea People warriors in front of Mycenae (about 1200 BC) drawing by Jeison de Souza from Brasil . 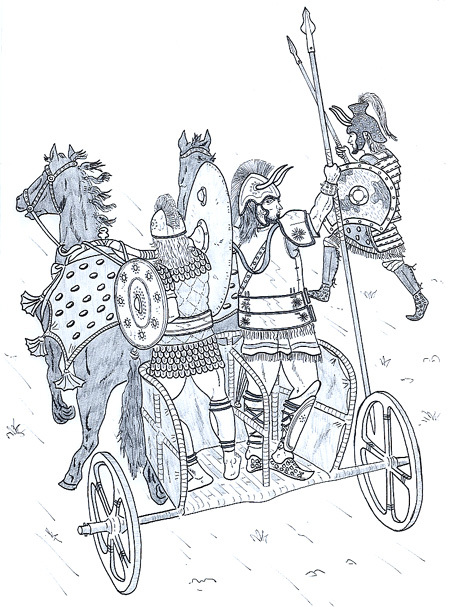 Achaean war chariot 1250 BC (artist Andrea Salimbeti based on Angus Mc Bride drawing). 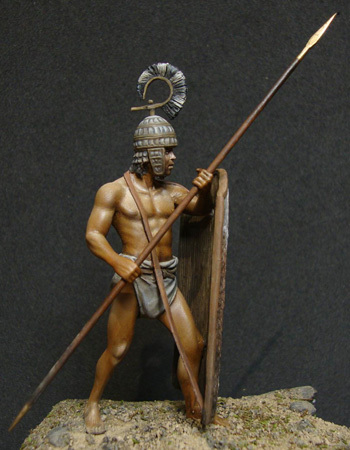 Achaean warrior "wearing the bronze" (Thebes 1300-1250 BC) artist Andrea Salimbeti. 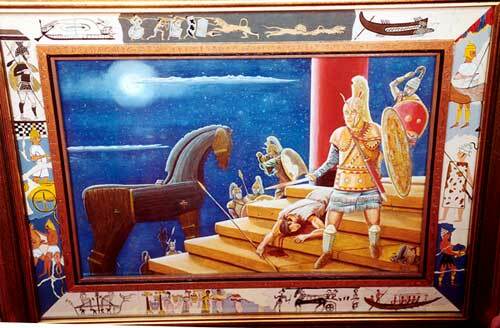 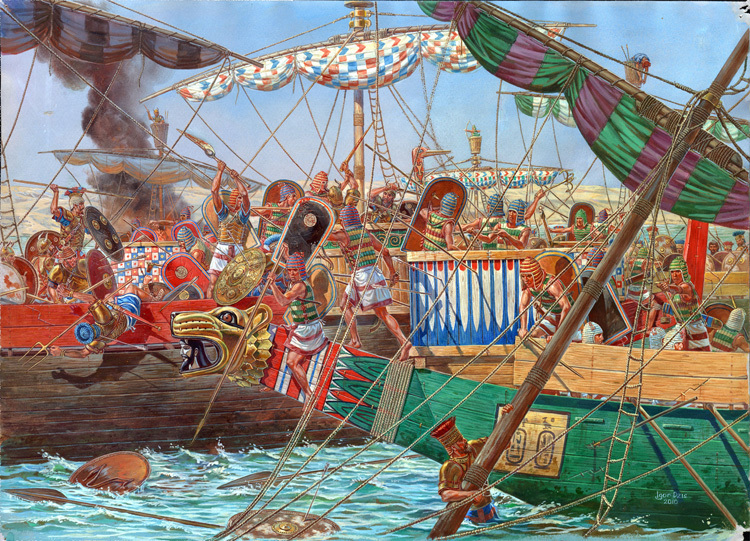 (Trojan war 1250-1210 BC) artist Andrea Salimbeti. 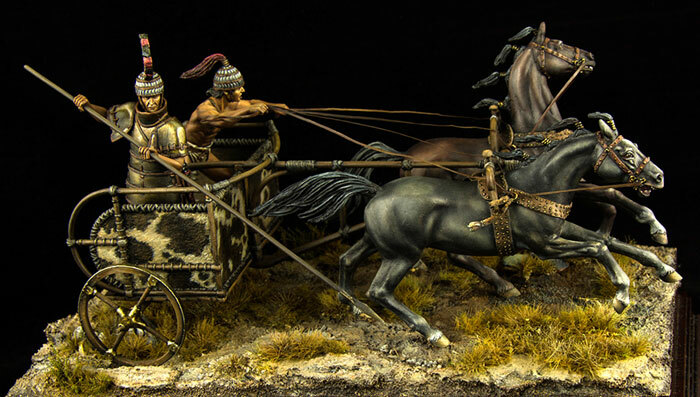 A gorgeous Achilleus (Trojan war 1250-1210 BC) artist Michael Oleksandriw. 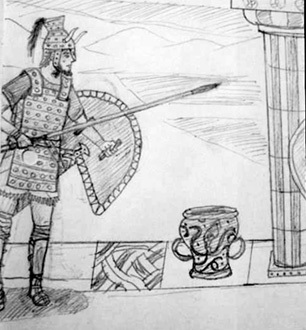 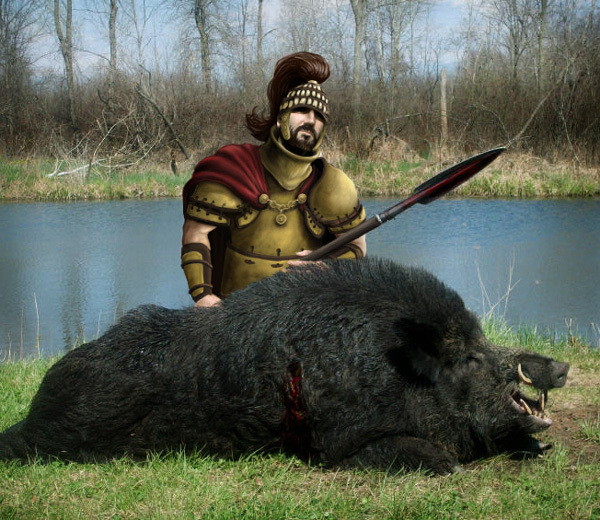 Achaean warlord "Boar hunting scene" (Argolid 1400 BC) artist Panaiotis Kruklidis. 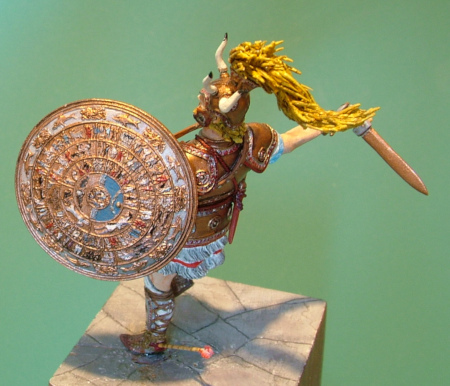 Ariadne (Knossos about 1400 BC) artist Chaz Truog (www.chaztruog.com). 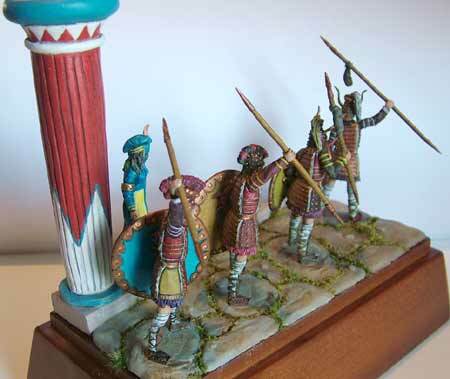 Cadmos (Beotia about 1500 BC) artist Peter Dennis. 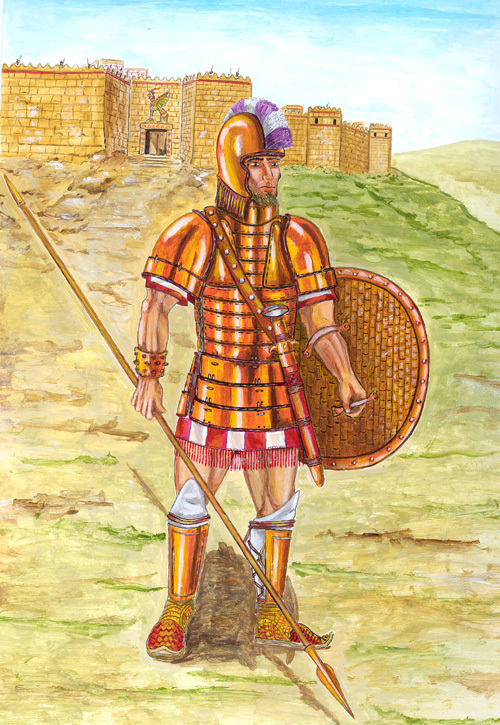 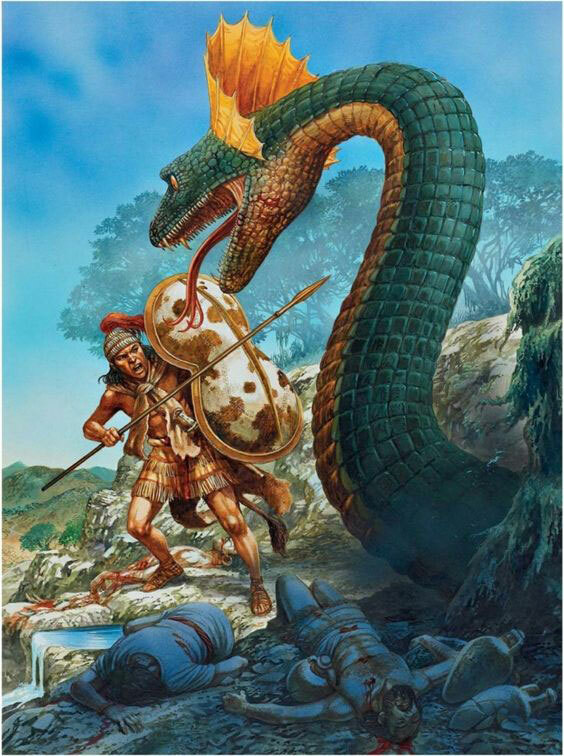 Achilles' son Neoptholemus wearing his father's armour (Trojan war 1250-1210 BC) Oil painting based on Trojan war tales (artist Andrea Salimbeti based on Angus Mc Bride drawing). 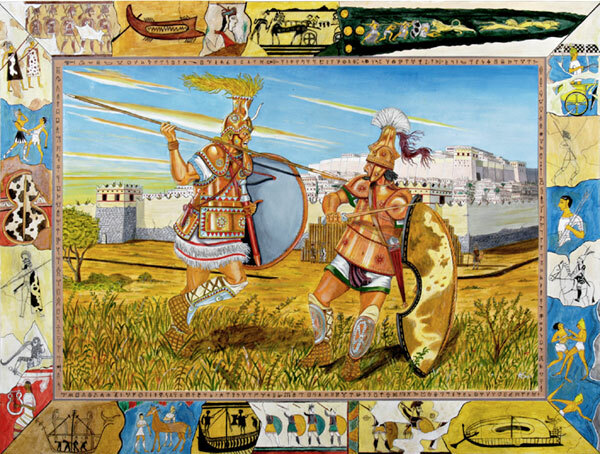 Achilles and Hector, duel under Troy VIi wall (Trojan war 1250-1210 BC) Oil painting based on Trojan war tales (artist Andrea Salimbeti based on Giorgio Albertini drawing) .